After five inches of rain, the Middle Fork crested at nearly 18.5 feet on February 21. This is the highest the river has been in nearly 25 years! While the Middle Fork has is receding, more rain is expected Friday and Saturday. The force of the Middle Fork in flood is depicted in this short video. 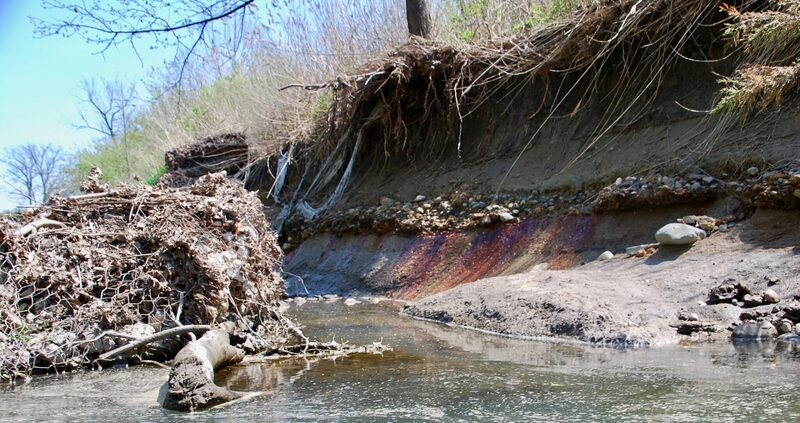 Erosion next to three coal ash pits has been a concern for decades, These pits, which contain 3.3. million cubic yards of coal ash are located in the river’s floodplain and obstruct the normal flow of the Middle Fork. Armoring installed in the 1980’s along the two oldest pits has deteriorated, or has sloughed off the banks into the river channel. The natural erosional forces of the Middle Fork River have ripped away gabions (wire cages filled with rock) installed by Illinois Power to protect the riverbank that abuts the Old East Ash Pit, leaving exposed wires in the channel. Photo by Pam Richart, Eco-Justice Collaborative. April 2016. Between 2009 and 2015, flooding of the Middle Fork caused nearly 20 feet of erosion along the New East Ash, and much of that occurred during two 2015 storms. This caused Dynegy Midwest Generation, owner of the coal ash pits, to obtain permits from state and federal agencies to rebuild an area that originally protected the coal ash pit, and armor it with rip-rap. Today, just 15 to 30 feet of distance remains between the river channel and the Old East and North Ash Pits along a stretch of the river 775 feet long. We know from the extent of erosion that took place along the New East Ash Pit in just six years that this is not enough separation to protect the coal ash from the powerful forces of the meandering river. While Dyney plans to stabilize banks along its two oldest coal ash pits in a manner similar to that put in place along the New East Ash Pit, no riverbank stabilization lasts forever. You’ve seen our photos, and this video taken at the Kickapoo State Park Bridge late in the afternoon on February 21, 2018, shows the power of the Middle Fork in flood. Eco-Justice Collaborative is meeting with the Illinois EPA and Vermilion County officials on Monday. Could you take the time to place a call to IEPA Director Alec Messina? Ask him to do whatever he can to ensure Dyngy moves its coal ash out of the floodplain to a safe location away from the river. Please call and leave a message for him at this number: (217) 782-0547. Moving the ash is the only solution that will forever protect the Middle Fork, and all who depend on it for recreation, tourism, and economic development, from a potential coal ash spill. Why would we settle for anything less?